Two years ago we cycled along the banks of the Loire in the Tours area and came across the town of Vouvray. We are big fans of the sparkling wine of the Loire and we’ve visited two caves in Saumur, one of them famous for their classic Vouvray wines – we had no idea that there was a real place of that name further up river until we wobbled through on our bikes that day. We stopped for a picnic beside the Motorhome Aire and promised ourselves that one day we would come back, stay overnight and go and taste the wines from the other manufacturers in the very place it is named after. Today was the day! We left Mennetou sur Cher and drove smartly west, excited at the prospect of tasting some bubbly and maybe even finding one we prefer to our current favourites. We were sadly disappointed to find, as we approached the Aire, that there were only three places and they were already full. The occupiers eyed us with a mixture of defensiveness and smug satisfaction – those babies were going nowhere. We hovered nearby in case one of them decided they had had enough of this sunny spot with picnic tables and an area of grass for relaxing on after having their fill of possibly the best sparking wine in the known Universe. Who were we kidding? After half an hour and a bit of whimpering we gave up, opened the Camper Contact App and looked for an alternative spot not too far away. I’m not going to name the spot we moved to, for reasons that will become clear but we found a local wine producer with a cave offering tastings, with a large space available for motorhomes to stay overnight. If after you’ve read this you’d like to know which cave we visited send me an email and I’ll tell you. When we turned up the cave owner came out to greet us, showed us the lovely space he had set aside for motorhomes and invited us to come back around 6 p.m. for a tour and tasting. He spoke good English and said that if other motorhomes turned up we could do the tour together. Fabulous! We were very excited and delighted with the grassy space, the peace and the promise of some wine from the manufacturer himself. At 6.00 p.m. it became obvious that we were the only motorhomers in that night so we trotted along to begin our tour. The owner reminded us that it is very cold in a cave so to bring our jackets. Outside it was about 32c but we knew from experience that he was right so we donned our fleeces and followed him into the cave. it was impossible to guess that man’s age but he told us, almost straight away, that he had worked in the cave since 1949. A quick bit of mental arithmetic told us that even if he started work at the age of 13 he must now be 80 and still working full time. Incredible that he was so sprightly we thought. I then noticed that his eyesight was very poor – something that became even more obvious when he handed us very dirty glasses to taste the wine in. When I say dirty, I don’t mean with the dregs of someone else’s wine in – I mean smudges and dirty hand prints on the outside. We took a deep breath, decided that alcohol would kill most things and accepted the first taste. He knew a lot about wine, of course, and an awful lot about history and entertained us with interesting facts about the connection between Britain and France as we tasted the different wines on offer. He taught us which wines should correctly be served with different foods and gave us an excellent explanation of how different weather conditions change the sugar content of the grapes and the quality of the wine. This man was truly an expert and we were astonished to hear that he manages the whole process himself. The only time he has anyone to help him is for the harvest – everything else is done by him alone. After the tasting he showed us round his cave, took us up some roughly hewn steps to the group tasting room where he used to have coach parties. ‘They haven’t been for a while’ he said. The whole place had a thick layer of dust and the plastic chairs, once white, were now grey. We realised straight away that he couldn’t see this and we tried to imagine the coach parties being appalled at being handed dirty glasses and sitting on dusty chairs. This man is one of life’s true characters – a real gem – but he needs help, if nothing else to wash his wine glasses. I wanted to offer but I feared it would be rude – and how could I tell him that they were dirty? We bought some of his wine. We haven’t tried it yet but we’re hopeful of good things. He is a master craftsman after all. We slept well that night, probably as a result of tasting about 8 different wines before dinner, and set off the next morning to a place we know well. We stopped at La Ville aux Dames near Tours for a visit to the supermarket for food and to Decathlon to buy chain oil for the bikes. I have a bit of history with that particular Decathlon but fortunately they didn’t appear to remember me from my last visit. Two years ago I went in there because I had a puncture on my bike. I hoped they had a bike repair service but they didn’t. I’d worked out how to ask if they did repairs but it was only when I was in the shop that I realised I had no idea how to say that I had a puncture. No-one in the shop spoke any English so I ended up waving my arms in a circular motion whilst pedalling with my feet and making air escape type noises to give them an idea what the problem was. Most of the staff who had gathered to watch the display managed to more or less keep their faces straight but some of them made some air escaping noises too. Nice when people come out in sympathy isn’t it? This time it was simple because Adrian had done the homework for me and sent an email with instructions what to look for. The subject line of his email said “Advice about lube”. It crossed my mind that this fell into the category of things you never thought you’d hear your son say to you. We’ve developed a little rhythm to our travelling days. We stay on Aires for four or five nights then go to a campsite to do our washing, plug into the electrics and enjoy a bit of extra space. Our choice of campsite this time was made in order to have a little recce. This year we’d had a plan to have friends come and spend a week with us in France and we’d seen this campsite that had both touring pitches and chalets to let. Sadly the plan fell through but we decided to have a look at the site anyway, to see if it would have been a good choice. Camping Loire et Chateaux is on the edge of the village of Bréhemont and is a new site. The advertising said it was a good place to cycle to three different chateaux and to enjoy the Loire cycle route. We didn’t actually get our bikes off the back to try out the routes but we did discover that the village has invested a lot in the comfort of cyclists. There is a bike wash and tyre pumping station next to a toilet for cyclists. Round the corner, looking out over the Loire is a cyclists’ café that offers running repairs as well as good food, outside and inside seating and a friendly owner who knows a lot about bikes. The camp site is very new so it looks a bit bare, with shrubs that haven’t had time to grow and pitches separated by wire fences. In a year or two it will be much more attractive. The facilities are brand new and excellent and the owners are friendly, welcoming and speak good English. We did our washing and sat out the mother and father of a howling gale with torrential rain. We had superb free wifi so time passed quickly watching Netflix, playing games and eating. We enjoyed it here but we weren’t very sure whether it would have been a good spot for our week with friends. We have a definite preference for well established sites with plenty of choice of shade and sun – this one will get there eventually. After two nights we were ready to move on and our first stop was only six miles away. We visited Azay le Rideau – once again on a fact finding mission. Another thought for our friends’ visit had been to rent a gite and we had identified one in Azay le R. It looked ideal for our needs with only one problem. The owner measured the drive and said it wasn’t big enough for us to park the motorhome. We were disappointed because the house looked ideal for four people to chill out and enjoy all that the Loire Valley has to offer. The owner of the gite suggested to us that we could park the motorhome outside the local campsite that would be closed in September. We weren’t at all convinced that this was a good idea so we decided against booking the gite. Being so close to the place, it seemed like a good plan to go and see whether such an arrangement would have been possible. It wouldn’t, so the decision was the right one. All that being said, Azay le Rideau is a beautiful place with a chateau on the banks of L’Indre river. It is a true tourist town and for once we found lots of shops and eateries open on a Sunday. We strolled through the town in the sunshine, seriously considered paying the 8€ to park in the rather smart Aire de Camping Car for a night so that we could leave the dogs and visit the chateaux but for some reason we had no appetite for doing the tourist thing. The place was heaving with people, the pavement cafés were full and it was hot. We decided to move on to somewhere quieter. We did buy two things in Azay. One was some quiche for tea from a very swanky delicatessen and the other was a corkscrew. Readers might find this hard to believe but we haven’t had a corkscrew on board since we left Scotland. Our wine drinking has therefore been limited to the bubbly stuff and some German wine with a screw top. The corked stuff had been tormenting us from its place under the passenger seats and we kept forgetting to buy the blasted tire-bouchon (tr, corkscrew). We found a tourist tat shop in Azay that had some kitchen stuff and Shirley went in and bought a nifty little corkscrew with Azay le Rideau printed on its side and a ludicrous price tag. We didn’t care. That Alsace Riesling was calling to us and we were having it with our dinner even if it meant buying a corkscrew with no street cred at all. Next stop was a beautiful little town on the banks of the Loire – Chouzé sur Loire. The town has crafted a gorgeous little Aire de CC in the middle of the town complete with separate pitches and picnic benches. We pulled in there to have lunch and go for a walk along the river bank. The views along the sparkling Loire were gorgeous in the afternoon sunshine and the cycle/walking path was beautifully kept but having had our fill of Sunday afternoon strolling we decided it was still too early to stop for the night. We were off again – this time to one of our all time favourite Aires. About four miles outside Saumur in Dampierre sure Loire is an Aire on the banks of the river that was once a campsite. It is huge, offering loads of places to stop with a choice of sunshine or shade. To stay a night it costs 7€ but this includes unlimited use of the service point, peace and quiet and a proper cycle path that goes right in to Saumur with all its delights. We love it here. The one bit of grit in our vaseline is that Poppy has developed a passion for acorns. All the wooded sites around here have thousands of them on the ground and given half a chance Poppy crunches them up like sweeties. Acorns are bad for dogs, although Poppy refuses to accept this piece of wisdom. The outcome when she does get hold of some of them is intestinal hurry of epic proportions. Apart from our astonishment that a dog weighing 8 kg can poo about half her body weight, the business of picking it up in a poo bag can really put you off your lunchtime baguette and brie. 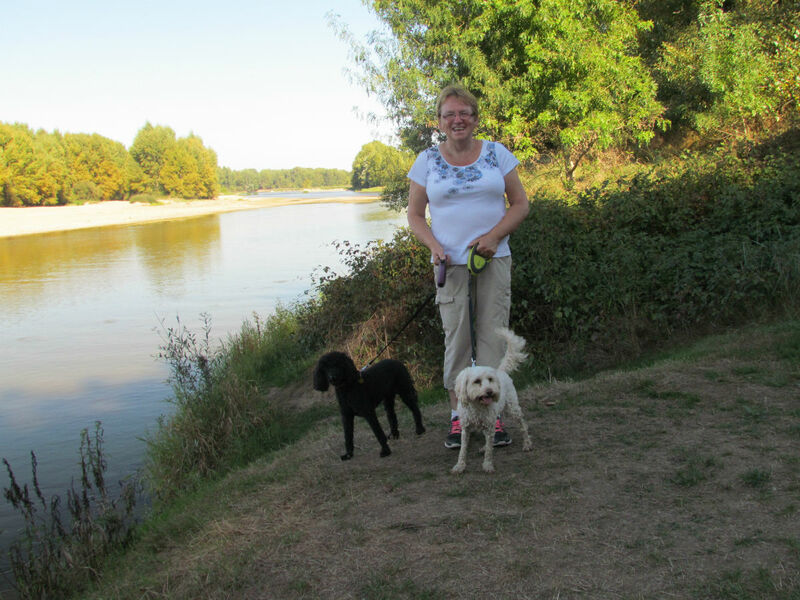 After a good long walk first thing in the morning we left the dogs in the van, got the bikes off the back and cycled into Saumur. We did this two years ago, only to discover that the chateau was closed for refurbishment. We didn’t discover this until we had walked up a mountain of steps to the escarpment where the chateau sits in all its splendour. Our second attempt at a visit began with us cycling along the bike path reminiscing about that wasted trip and laughing at not checking that it was open before we hauled ourselves up the steps. Guess what. It’s still closed and we did it again – locked our bikes up at the bottom, dragged our sorry butts up those thousands of steps and found the chateau still closed. We have now renamed the chateau at Saumur ‘Chateau Fermé’. Shirley at Chateau Fermé, before she discovered we could go no further. So we retraced our steps of two years ago, retrieved our bikes and went into town for a coffee. We love this town – even though it would make sense to visit places we’ve never been to before we can never resist another visit here. Before we leave we’ll pull in at the Cave Langlois, buy half a dozen bottles of our favourite Crémant de Loire and give thanks once again for this beautiful place. Great read, look forward to your blogs. Would be nice if you could incorporate a map showing your progress. Hi Margaret and Shirley, I expect the chateau at Saumur closed for season as it was open every day when we were there in July.